The next step is creating a Minimum Viable Product (MVP) to test your hypothesis. This is focused on your unique value proposition but typically also provides a little bit of “Tablestakes” features just to make sure it is “Viable” as a product. Your MVP is also an hypothesis. It might be good enough to find Product Market Fit or not. The case where each potential customer you engage tells you “This is great but in order for me to use it I need X” and X is different for each customer/user is shown below. This shows you are not in a Product Market Fit yet. Let’s say MVP2 is successful and you are seeing real traction of early adopters. You want to increase growth and are looking for deeper penetration of your early adopters as well as bringing on new clients some of them beyond the early adopters crowd. Based on feedback you’ve been collecting and your product management research you have a couple of areas that can potentially bring this growth. Some of them by the way extend your unique value proposition and some of them make your current product more robust. There you have it. The full model. Essentially my point is that you grow a product in uncertain markets by attempting various MVPs. Then once you achieve Product Market Fit you mix MMFs and MVFs depending on the level of Business/Requirements uncertainty in the areas you are focusing on. While MVPs/MMFs/MVPs are atomic from a business perspective (you cannot deploy and learn from something smaller) they might be quite big from an implementation perspective. The dinosaur carpaccio now comes in as slicing each of those pieces here to smaller slices aimed at reducing execution/technology risk. (typically these are called User Stories) Those smaller slices might have tangible business value but on the other hand some might not. It is more important for them to provide early implementation decision feedback along the way. Feel free to use this model. Let me know what you think about it and how I can improve it! This entry was posted in Agile, Lean Startup, Product Ownership and tagged Lean Startup, MMF, MVF, MVP, User Stories, Validated Learning on December 30, 2012 by Yuval Yeret. As I prepare to check out from the Boston Seaport Hotel which was the venue of this year’s LSSC conference (and did a magnificent job hosting us! ), here are my highlights/impressions of the conference. The buzzword of the conference seems to have been “Lean Startup”. It permeated into many talks (including mine) in two main aspects – One was the classic product/customer-focused Lean Startup as an alternative narrative to Lean/Agile. The other was taking the ideas of fast cycles of Validated Learning and adopting them as a narrative for the approach to change. This came up in Jeff Anderson’s ambitious and thought-provoking or even provocative talk about the transition participation engine as well as in my attempt to “fix” continuous improvement. Topics like gamification tied into this a bit, and I think we barely scratched the surface on the discussion about what forms of gamification are appropriate for engaging people in lean/agile change, if any. I had the chance to talk to Troy Magennis about Simulations and although skeptic, I see some promise in the usage of simulations not only for forecasting and risk management but also for studying and choosing experiments to run as part of the improvement cycle. Interestingly, LeanKit Kanban announced they intend to integrate this simulation capability into their Kanban tool. I’m looking forward to seeing how that works out. Getting back to Lean Startup, there were several discussions trying to compare Set Based Concurrent Engineering with the Lean Startup Minimum Viable Product Split Testing approach. For me Set-Based is aimed at reducing technical risk trading money for accelerated time and robustness while MVPs are aimed at reducing business risk avoiding investing money in products/technologies that are irrelevant. So one basically would try to start with a Customer Development approach using MVP. If the business model is proven, continue to implement the technology. If an initial MVP is very expensive/risky to the point of requiring Set-based, I would try to use a non-product MVP first (The Pretotyping concept makes a good differentiation between different kinds of ways to “fake it until you make it”). If I feel good enough about the business model, but not yet sure, I would indeed use Set-based focused on my next level of MVP (but not the full first release of the product) to accelerate learning and reduce technology risks on the way to the MVP. Then launch my MVP and fine-tune it using the Build-Measure-Learn cycle. If indeed I find Product-Market fit AND there are major technological aspects still missing I might use Set-based again. To sum up, they can probably be used together in different phases of the product/business lifecycle. But it is the MVP that should drive the need for Set-based. In general, validating the business need BEFORE focusing on various technological choices is a point that cannot be emphasized enough based on what I heard in sessions and offline discussions. I finally had a chance to meet Claudio (@AgileSensei) and see his A3 talk, which was magnificent as expected. I really need to integrate more of this thinking into my work. I’m especially going to focus on the usage of A3 to accompany management workshops I use for initial thinking and studying how to approach a change initiative for an organization. Don Reinertsen hit a home run again with a fabulous session about Decentralized Control, the last chapter in his Principles of Product Development Flow book. He presented concepts like the reality of uncertainty and how to deal with the need for both decentralization as well as alignment using Doctrine, Commander’s Intent as well as great examples such as Firefighting being more disciplined and effectively executed than IT work. This was also a highly interactive session with Don engaging the crowd, including Andrew Fuqua who happens to be an actual certified burn master commenting on the immense complexity rising from the fact that fires affect weather which in turn affects fires. The Brickell Key Award for 2012 was awarded this week. After a nerve-wrecking evening, the winners were announced – my friends Arne Roock and Jim Benson. Congratulations for a well deserved celebration of their contribution to the international Lean/Kanban community. Another announcement this week was reorganizing the Lean Software and Systems Consortium into the Lean Systems Society, a change that strives to emphasize even more the openness and nurturing of new ideas and approaches instead of freezing current models. I’m proud to be one of the founding fellows in the society. Beyond these highlights there were many conversations and interesting sessions, and I head home energized full of ideas and thoughts looking forward to share them with the AgileSparks team and my clients. It is as usual great to meet many old friends and make new ones and hear many appreciations for work I’ve been doing. Cannot wait for LSSC13 in Chicago (29/April-1/May 2013, the new JW Marriott)! 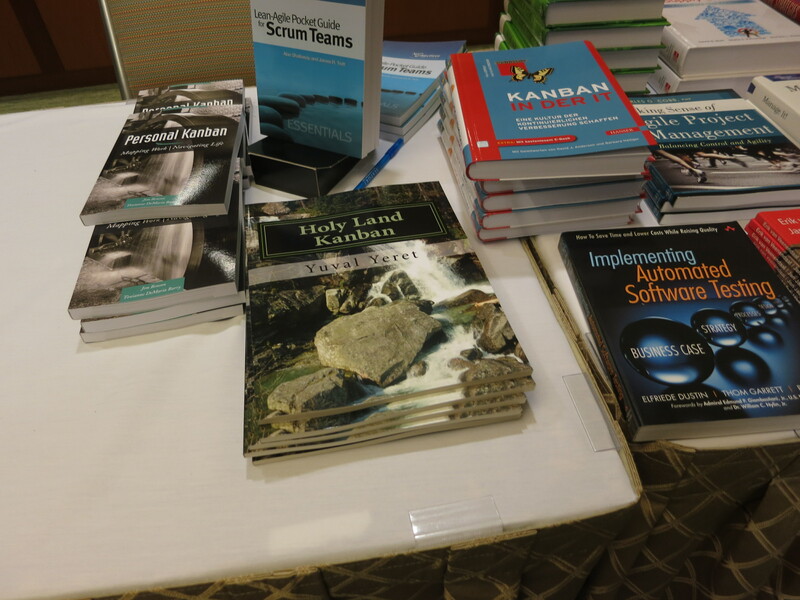 Oh, and the Holy Land Kanban book sold quite well at the book corner… Inviting readers to write reviews/comments – keep it honest! This entry was posted in Events, kanban, Lean Startup, Uncategorized and tagged kanban, Lean Startup, LS4Chg, LSS, LSSC, LSSC12 on May 17, 2012 by Yuval Yeret. Where is the “Customer Development” aspect of the Lean Startup for Change approach? I recently wrote about finding the Minimum Viable Change and have been thinking about it some more, especially while working on my presentation for upcoming Scrum Gathering Atlanta and Lean Systems and Software Conference in Boston. While trying to think what I’m going to say about Minimum Viable Change (MVC) I began to think about how to map the MVC to Minimum Viable Product, finding Product Market Fit and the Customer Development Process. In my mind so far, as well as in how I understand the work of Jeff Anderson and his team on this subject, the MVC is aimed at learning what approach works best in your context and doing experiments to adapt the approach. This is similar to using MVP to find Product Market Fit with your core Product capabilities as the base you pivot around. For MVC the core capability you pivot around seems to be the Hypothesis that the direction/vision you have for the organization is indeed a good fit for what the organization needs. As I understand it, Customer Development in the Product context is about finding a customer segment for which your MVP is a good fit. In the Change context Customer Development can be about finding the customer segment for which your MVC is a good fit, but this is more similar to classic Lean Startup. When we are talking MVC we are talking about searching for the right kinds of change WITHIN a change initiative you are already running. So what is the Customer Development process? Is it searching for groups within the organization for which the MVC is good enough so they can use it to change and you can learn about the change approach together with them? Is it something that tries to verify that indeed the organization WILL benefit from this change program, rather than taking it for granted? There is lots of value in seeking the right change approach using tactical MVCs. I think there might be at least as much value if not more in seeking fast learning on whether the change is the right one using strategic MVCs. Hunch1: Small Batches are a good idea to deal with planning waste and effectiveness as well as bang for the buck product value for investment. We are testing that hunch using an experiment involving work on Product Backlogs / MMFs / Stories in 2 product streams. Any feedback welcome, and if you want to discuss in person, find me in Atlanta or Boston during the conferences, or check out a Kanban/Scrumban training we are opening in Atlanta just after the Scrum Gathering. This entry was posted in Change Management, kanban, Lean Startup and tagged kanban, Lean Startup, Minimum Viable Change, MVC on April 11, 2012 by Yuval Yeret. A discussion about Kanban Training Materials with Mike Burrows has nudged me to give more emphasis to the foundational principles and core practices. 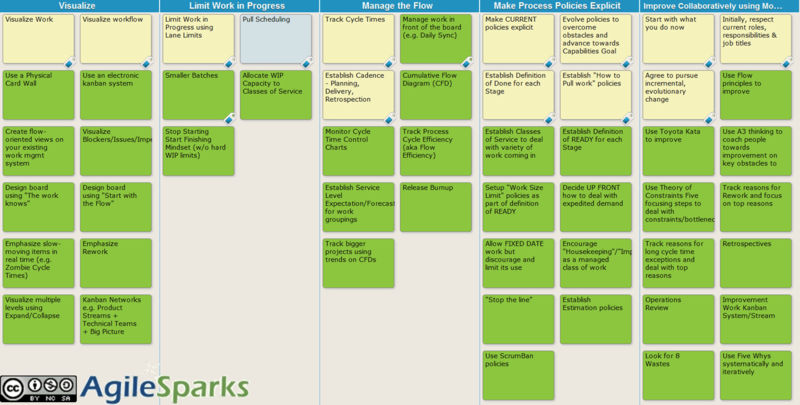 The culmination of all this is that I created a Story Map to reflect the Kanban Method approach to evolutionary change. This maps the foundational principles and core practice areas to actual core and optional practices and can help me explain Kanban in our 2-day Accredited Kanban Training (next date is 20-21 march in Israel btw) . I’m also thinking of creating exercises using this map to explain story mapping itself as well as the concept of “Minimally Viable Change/Product”. And it seems like Jeff, Jabe myself and probably Mike and others will share experiences at LSSC12. See you there! This entry was posted in Change Management, kanban, Lean Startup and tagged kanban, Lean Startup, LSSC12, Minimally Viable Change, MVP, Story Map on March 9, 2012 by Yuval Yeret.